Recently one of my friends on Facebook posted a drawing about success. I took the liberty of drawing a copy of it. In art school, copying the drawing of another artist, particularly a dead one, is acceptable if you write “After and insert name of the artist whose work you copied following the title of the drawing. In nursing, copying a written policy of another institution or department by using it as a template is legitimized by the phrase, “Don’t reinvent the wheel.” My point, is this: I copied the above drawing from an unidentified artist on Facebook, because it illustrates the path of success. Maybe not the path of your success, but certainly mine, and that of many artists, writers, and nurses. The definition of success has plagued creative and ambitious people since, well, the invention of the wheel. Is success defined by external validation from society in the form of wealth, fame, and Klout score? Or is it generated within the individual, an internal sense of satisfaction derived from knowing that what one contributes holds merit, whether society recognizes it or not? This brings to mind the contrast between the fictional character Ebenezer Scrooge, who’s myopic vision of success impoverished his soul, and the nonfictional, archetypical starving artist Vincent van Gogh, living in poverty for the sake of his art. Both had destructive relationships with success. A similar disparity exists in nursing, which demands intellect, critical thinking, and expensive educations as avenues of success, but offers limited career paths and varying financial incentives in return. Nevertheless, nursing’s contributions to society, and those of artists, are not diminished, though some find it difficult reconciling commercial success with creativity, or caregivers. While writing posts for this blog, I ponder the meaning of success. Success as a blogger, writer and artist is often hidden in the squiggles, but it is not lost in them. The blog bears fruit. It has attracted opportunities for the sale of my stories and artwork. Moreover, within the squiggles I have discovered an Internet community of artist, writer, nurse companions, and like-minded readers through blogging. With such camaraderie, getting lost in the squiggles becomes a camping trip instead of The Exodus. 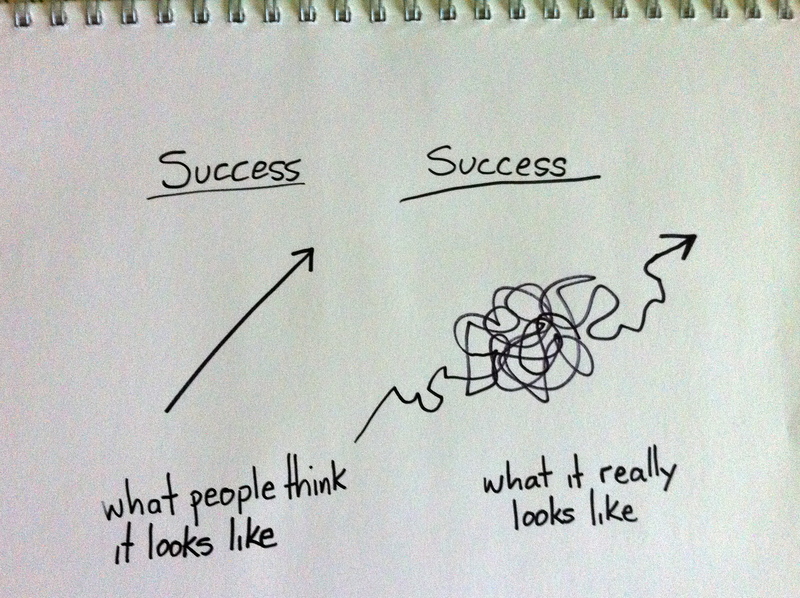 If you are a passionate blogger, artist, or nurse currently lost in the squiggles on the Road to Success, keep going. You are not alone. This entry was posted in Posts About Art & Nursing and tagged Art, art and nursing, blogging, nurse, nurse blogs, Social Networking, the creative life, the meaning of success by jparadisirn. Bookmark the permalink.